Is Wheel Alignment or Wheel Balancing the Problem? Experts in road safety always emphasize how important it is to regularly maintain your vehicle. As an owner, you need to pay attention to every component of your vehicle in order to avoid car crashes. One of the aspects commonly taken for granted is wheel alignment and wheel balancing. What is the difference between the two concepts? 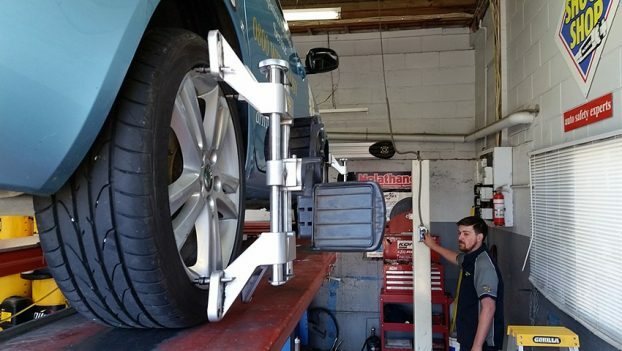 Wheel alignment is the proper adjustment of the wheel’s angles in such a way that they are parallel with each other while also perpendicular to the ground. This aims to maximize the longevity of your tires. It will also help your car to go straight when you are travelling on a straight and even road. On the other hand, wheel balancing aims to provide stability to all of the wheels. This facilitates rotation of the wheels in a balanced manner to avoid producing vibrations that may be felt when driving. Such vibrations can lead to mechanical or internal problems in the suspension and steering mechanism. If you are confused on how to determine which of the two will resolve the problems you are experiencing with your car, here are some signs you can look for. The interior or exterior of your wheels has an uneven tread wear. Your vehicle keeps on veering to the left or right even if you are trying to drive on a straight line. The steering wheel is going off center while travelling on a straight road. This problem is corrected by placing the vehicle on a platform, which makes the wheels spin. A system calculates the orientation and compares it to the specifications set by the manufacturer. The needed adjustment is done and checked again. You feel vibrations on your steering wheel when you reach a particular speed, usually at 75km per hour or higher. You feel vibrations on your floorboard or seat when you travel at a certain speed. The wheels tend to wear out improperly. There is a presence of cupped or concave wear patterns on the wheels. Problems in wheel balancing are commonly resolved by adding extra weight on the opposite side of the heavier wheel. Improper wheel alignment or wheel balancing may have an effect on fuel consumption and compromise the safety of you and your passengers. A lot of people often have the misconception that they need to get their car checked for one problem when there is actually two. If you are having a hard time differentiating the two concepts, it is best to consult a professional tire and auto company. An auto expert can likewise explain to you some basic concepts to help you better understand your vehicle. Next story Many Business But One Solution – UK Label Manufacturers!